The Senate has ordered the discontinuation of the case filed at the Supreme Court on the suspension of Justice Walter Onnoghen as the Chief Justice of Nigeria. Special Adviser to Senate President Bukola Saraki, Yusuph Olaniyonu, disclosed this in a statement on Monday. According to him, the decision following the intervention of the National Judicial Council (NJC) on the issue. Olaniyonu explained that the lawmakers decided to discontinue the case at the apex court in order to give the NJC intervention a chance. “The Senate has, therefore, decided to discontinue the case it filed in the Supreme Court,” he said. “It should be noted that the case has been slated for hearing tomorrow (Tuesday). “This decision also affirms the confidence of the Senate in the ability of the NJC to successfully and creditably resolve the issues,” the Senate President’s media aide added. On January 25, President Muhammadu Buhari suspended Justice Onnoghen and appointed Justice Ibrahim Tanko Mohammed as the acting CJN. 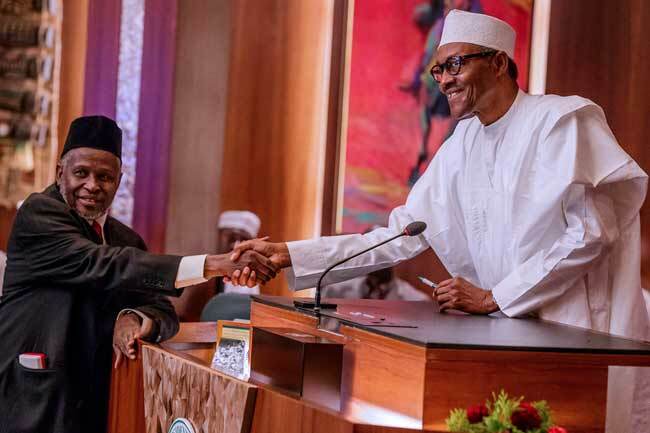 President Muhammadu Buhari shakes hands with acting Chief Justice of Nigeria, Justice Ibrahim Tanko Mohammed, at the State House in Abuja on January 25, 2019. Inset: Justice Walter Onnoghen. The President had explained that his decision followed an order of the Code of Conduct Tribunal (CCT), pending the completion of Onnoghen’s trial. The Code of Conduct Bureau (CCB) had dragged Justice Onnoghen before the Tribunal over allegations of non-declaration of assets. The President’s decision sparked widespread criticism from individuals and groups within and outside the country. Lawmakers at the upper chamber of the National Assembly had planned to reconvene but later filed a case at the Supreme Court on the suspension of Justice Onnoghen. They had sought the interpretation of the court on whether President Buhari acted within the provision of the Constitution in suspending Onnoghen. The Senate also asked the court to determine whether the action of the President does amount to usurpation of the powers of the Red Chamber, as provided for in Section 292 of the Constitution. On Tuesday last week, the NJC held an emergency meeting which was presided over by a former president of the Appeal Court, Justice Umar Abdullahi. The judicial body gave Justice Onnoghen and Justice Tanko seven working days to respond to different petitions against them. The NJC is expected to reconvene on Monday next week.